This is a touch out of date now, but for the sake of completeness I thought I'd post it. A final look at the recent Wetherspoon's festival. Despite my visit being on the last day of the event, there was still plenty of beer to be had. Roosters Patriot: A golden ale that was pretty much average in just about every way, made more appealing by the glorious sunshine outside. Clean and refreshing, citrus notes and a crisp bitter finish. Serve this cold on a summers day with a barbecued burger and you're on to a winner. Don't go out of your way for it though. 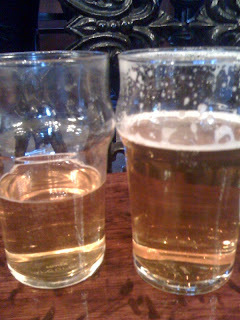 Sharp's Gentle Jane: Described in the festival as "naturally hazy in appearance" but served to me brilliantly bright. I enjoyed this tremendously. The aroma is floral lemons, the palate is slightly sweet at first, dominated by lemony citrus and then moderately bitter in the finish. There's some suggestion of spice from the Belgian yeast strain that's used to ferment the beer, but it serves to accent only and never threatens to dominate and take over like it often can. It's a shame this isn't bottled, I would love to try it with fish and chips back home at the beach, I think it would work perfectly. Otter Mild: I found this to be a shade lighter than the programmes "dark brown", more a bronze colour really. Not really what you want to be drinking when the spring sun is outside, struggling to make itself known. Nonetheless this was enjoyable and served in excellent condition. The dominant flavour is roasty malt with chocolate behind that. There's a suggestion of berry fruit and a full, very smooth mouth feel. Very enjoyable. So until next time, that's that. The majority of the beers I've had during this festival have been very enjoyable. They've almost always been served in good condition and at a price that's more than reasonable. I've sample beers from breweries that don't typically service the London area, enjoyed imports and foreign beers brewed in England that seem to do justice to the original. Looking forward to the next one now. What were your highlights?